There are football stories and then there are football stories and this one is certainly not in the normal category of football news. This is a story about a creature with a great record on predicting the outcome of World Cup matches. However, this creature is unique as it comes in a form of an octopus. 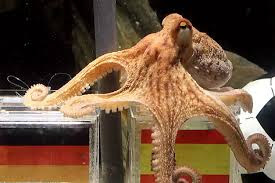 This octopus named Rabio the “psychic” even correctly predicted the results for Japan three group stage matches. This is how the story began of the football savvy octopus. The creature was caught by Kimio Abe a fisherman, whom then put the octopus in a pool of water. At this stage, for some reason unknown to us he decided to see if Rabio could predict how Japan would do at the World Cup. As it is always our first port of call after catching a sea creature to check it's football knowledge. The way in which Abe did this was to lay out three boxes before each Japan game and have the octopus pick one of the boxes. As one box represented a win for Japan, while one was for a draw with the final box being for a Japan defeat. In this experiment, Rabio moved towards the correct box each time predicting Japan's win over Colombia, its draw with Senegal and defeat to Poland. I know what you are all thinking now though is what did he say about the Belgium game. Well, unfortunately, we will never know as Kimio Abe decided to sell it as seafood at the local market soon after it had correctly predicted the result in the Poland match.